I'm devastated. Ron is the guy who brought me from Caltech to ISI. He was the sweetest guy on the planet -- and one of the smartest. Ron was Caltech's very first CS Ph.D. I think there were two the year he graduated, and he came earlier in the alphabet, so he was the first to receive his diploma. Not mentioned in the obituary is that Ron was the pivotal technical figure in the early days of the MOSIS project (now MOSIS.com). MOSIS, many of you know, is the microchip prototyping service originally run by USC's Information Sciences Institute. When started in the early 1980s, the idea that you could email or FTP a VLSI chip design somewhere and receive several (hopefully) working pieces of silicon ten weeks later was extremely radical, and transformed VLSI research in the U.S. Ron and Danny Cohen were, if memory serves, the cofounders of the project. Ron was an early proponent of silicon compilation, taking a text program description of desired functions and creating a chip layout to match. His Integrated Circuit Language (ICL), a strongly-typed, polymorphic, garbage-collected, interactively compiled system, was perfect for the task. Unfortunately, Ron wasn't interested in playing the academic publishing game, and his influence is smaller than I think it ought to be. Ron was also very interested in computer graphics. His Ph.D. adviser was Ivan Sutherland, who essentially invented the field of computer graphics. In the early 1970s, Ron did some clever and beautiful wire-frame stereograms of mathematical functions (including a Klein bottle) and printed them on a large plotter. In Ron's story, Ivan was unimpressed, and he later discovered that Ivan lacked stereoscopic vision -- apparently a common trait. Ron may not (or may) have been as smart as Feynman, but he shared an intellectual trait: he thought *differently* from other people. He arrived at questions and solutions in a different fashion. He also had an impressive collection of Hawaiian shirts, and was a lousy but enthusiastic volleyball player, an incorrigible punster, and an unrepentant TECO user into at least the mid-1990s. One thing I remember is the clatter of his HP graphics terminal -- Ron could type at an incredible rate and attacked the keyboard ferociously. Ron worked very hard but also knew how to have some fun -- more than once he looked at me and said, "It's a beautiful day, let's go to the beach." And we knocked off work and went body-surfing. AYRES , Dr. Ronald F.
and Cal Tech Faculty Instructor. from natural causes at his home in Marina District on January 9, 2007. District at 611 San Vicente Blvd., Los Angeles. numerous competitions, scholarships and rewards. Debut Orchestra under the direction of Michel Tilson Thomas. later used to define and implement languages. on the enhancements and applications of his work. Type-centric ICL with modular implementation. beach bum who deeply loved his cat Precious. sister Denise, brother Gary, and father, Marx. One season (or half a season) doesn't make much of a trend, but the Daily Yomiuri today has an article on how warm things are in parts of Japan that are normally covered by snow this time of year. In Niigata, it's raining. In Gunma, ice fishing hasn't started yet because the lake hasn't frozen over. In parts of Niigata, they're golfing instead of skiing. In Aomori, they've had to postpone a series of ski competitions because there's no snow (and it's too warm to make any). Most of those parts of Japan are generally just below freezing in the winter, getting lots of snow but not really being bitterly cold. The paper says temperatures are 0.8 to 1.0C higher than average, but that sounds like an underestimate to me; 2-3C is what I would expect it to take to completely kill snow in those parts, but maybe it's more marginal than I think. And on the news last night, they said that Moscow is 10C warmer than typical this time of year. R. Van Meter, K. Nemoto, W.J. Munro, "Communication Links for Distributed Quantum Computation," is now available as quant-ph/0701043. Combined with papers such as "Arithmetic on a Distributed-Memory Quantum Multicomputer" (which is an extended version of our ISCA paper available on my publications page), we are gradually building a complete picture of a machine that will run quantum programs effectively in a distributed fashion. After last week's by the men's team over Bard College -- the first NCAA win in eleven years -- the women topped it with their first NCAA win ever, beating Pomona Saturday night. Go Beavers! Rick Greenwald has made a documentary called Quantum Hoops about the Caltech basketball team, which will premiere at the Santa Barbara International Film Festival in a few weeks. Good timing, Rick! It's too far a commute from Tokyo, but I certainly hope to see the film. Winny, the popular Japanese file sharing program, has been linked to at least 27 cases of data exposure from the GSDF (Ground Self-Defense Forces) since 2002. According to sources, no classified data has been compromised. Last February a big incident was discovered, which led the Defense Agency (as of yesterday, upgraded to the Defense Ministry, giving it a cabinet position for the first time since the war) to procure 56,0000 PCs to be used by SDF personnel. Why? Because they were using their home PCs for SDF-related work, due to lack of access to computers at work. Presumably it will be easier for them to prevent the installation of software such as Winny on ministry-owned computers, though repeated security breaches elsewhere via company-owned computers shows it to be no panacea. This is the same Winny whose author was recently convicted of knowingly supporting piracy of music and movies, but as far as I know, these kinds of data leaks are unintentional. I haven't followed the details of these breaches, but I suspect it's mis-setting of the controls resulting in accidental sharing, though it's also possible that there are security holes in Winny itself. 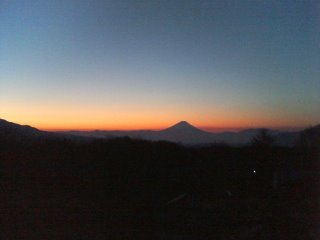 Mount Fuji at dawn on New Year's Day, taken near the border between Yamanashi and Nagano prefectures. Not a bad photo for a little cell phone camera. I'll be taking up a position as Assistant Professor of Environmental Information at Keio University's Shonan Fujisawa Campus. I plan to focus my research broadly on post-Moore's Law computer technologies, with emphasis on quantum computing, and on large-scale distributed storage systems.